Survival action game in which we find ourselves in a world dominated by zombies. Our goal is survival, but we must fight not only against the undead, but also against other people. Last Day on Earth: Survival is a mobile survival game for the AND and iOS platforms. The title was created by Kefir!, known for applications such as Forge of Glory and One Life. Production is available for free, but there are micropayments. In addition, an Internet connection is required for operation. In 2027 an epidemic broke out, which destroyed almost the entire population. Those who have managed to survive have to face another threat. The bodies of the fallen began to come to life and the times of zombies came. Players find themselves in a dangerous, zombie-controlled world where there is only one goal - to stay alive for as long as possible. In order to have any chance of survival, it is essential to take care of the necessary raw materials, thanks to which we will produce weapons. However, this is only the beginning of the struggle, because even with the best instrument of murder, we will not survive too long if we do not have a suitable shelter. We can build them ourselves and then secure them with traps. Not only will we rest in the building, but we will also leave the collected raw materials for which other players will certainly have a snoop. Of course, nothing stands in the way of us hunting other people's loot ourselves. 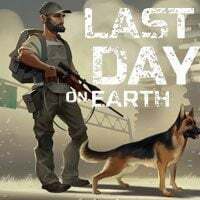 Last Day on Earth: Survival is full not only of zombies and survivors. Various dangers are lurking at practically every step - we can be attacked by animals, die of hunger or dehydration. In addition, we have to be aware of the weather conditions, e.g. during winter it is very easy to freeze. Vehicles help you to explore the environment and search for the elements you need. Just like other things, we can also produce them as part of crafting. The constructed machine is not only used for movement, but also for combat, after all, nothing stands in the way of driving a rushing car into the crowd of zombies. Last Day on Earth: Survival for AND and iOS is a multiplayer game. Although we spend most of our time alone, fighting for life, the world of production is inhabited by other people. They usually have bad intentions, but you can partly protect yourself from them by joining the clans. In this way, we increase our chances of gaining new land, exchanging valuable information, and so on. But be careful, because we can be betrayed at any time.